The Reds snapped their 5-game losing streak last night against the Phillies when they won 2-4. Photo from Better Off Red. Thanks, guys. Bronson Arroyo put in a good long outing, going 8.0 innings and allowing 2 runs (earned) on 5 hits. Cliff Lee was nearly as efficient and put up 6 quick, scoreless innings before a Joey Votto single, Brandon Phillips double, and 10-pitch walk to Jay Bruce threw him off his game. Phillips was the offensive star, with his 2-for-4 night and 2 RBI. Derrick Robinson also earned some of the limelight with his pinch-hit for Arroyo that eventually scored one of the runs. It didn’t hurt that he shares his name with the day we were celebrating, either. Tonight the Reds try to start a winning streak to even out that losing streak they just broke. Homer Bailey (RHP, 1-1, 5.73 ERA) goes against Kyle Kendrick (RHP, 1-1, 5.40 ERA) for the Phillies tonight at 7:10 p.m. in Cincinnati. The Reds have their first bobblehead giveaway of the season this weekend. 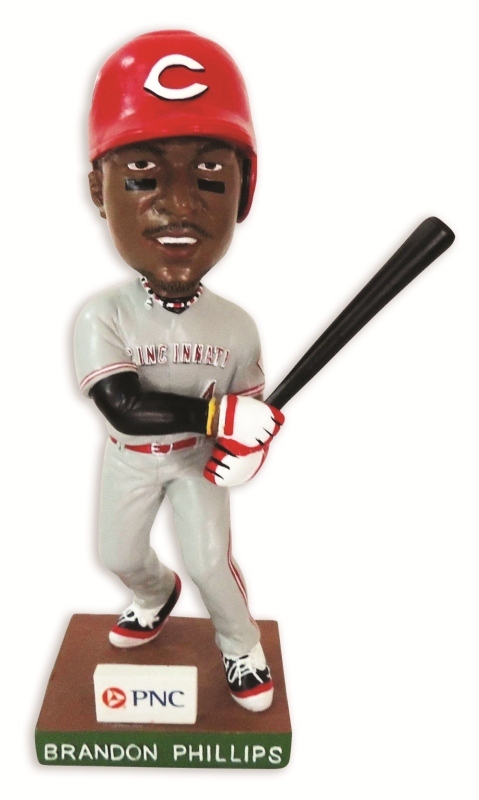 They’ll be handing out this bobbling version of Brandon Phillips to the first 30,000 tickets through the gates as they take on the Marlins at 1:10 p.m. In honor of Jackie Robinson Day, Harlem Globetrotter “Slick” Willie Shaw was the Reds’ honorary captain yesterday.